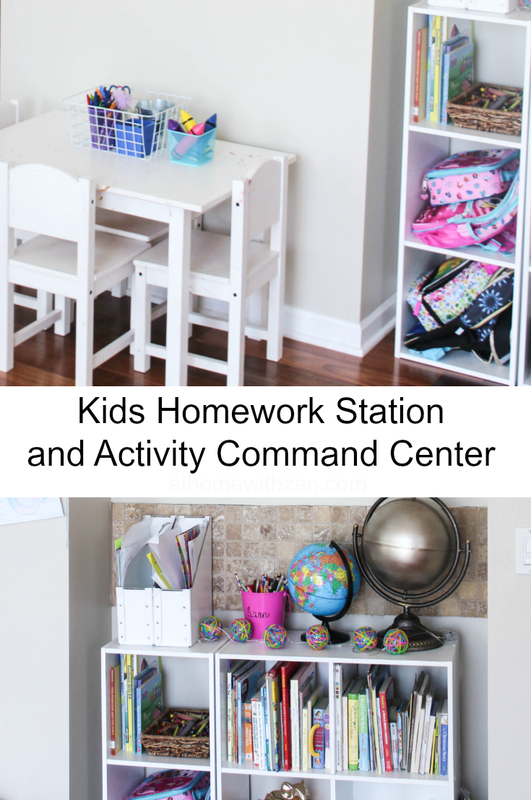 Creating a homework station and activity command center for the kids have made their after school routine so much smoother and have also given them a place to read, learn and be creative. Since the little kids have started school, I needed a place for them to do homework (if they had any), reload and unload their backpacks and school papers when they come home after school. This corner of our home seems to be the best spot to do so. 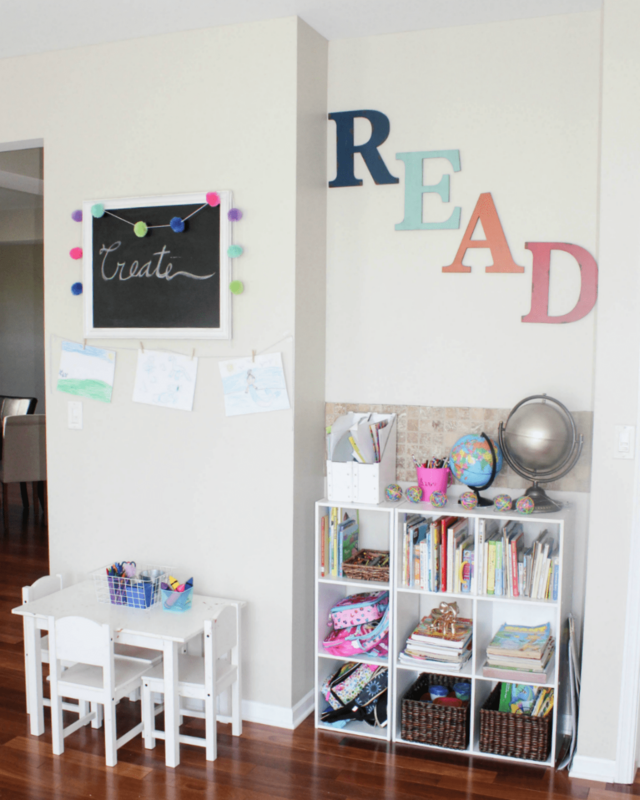 It also serves as the perfect corner to hold some of their non-school books, art, and other activity supplies. When we first moved, I wanted to make this area where the books are a command center since the laundry and mudroom is right there next to that wall. I had some temporary items such as small table, mail basket, etc. there already until I was able to gain the correct pieces and create the look I was going for. 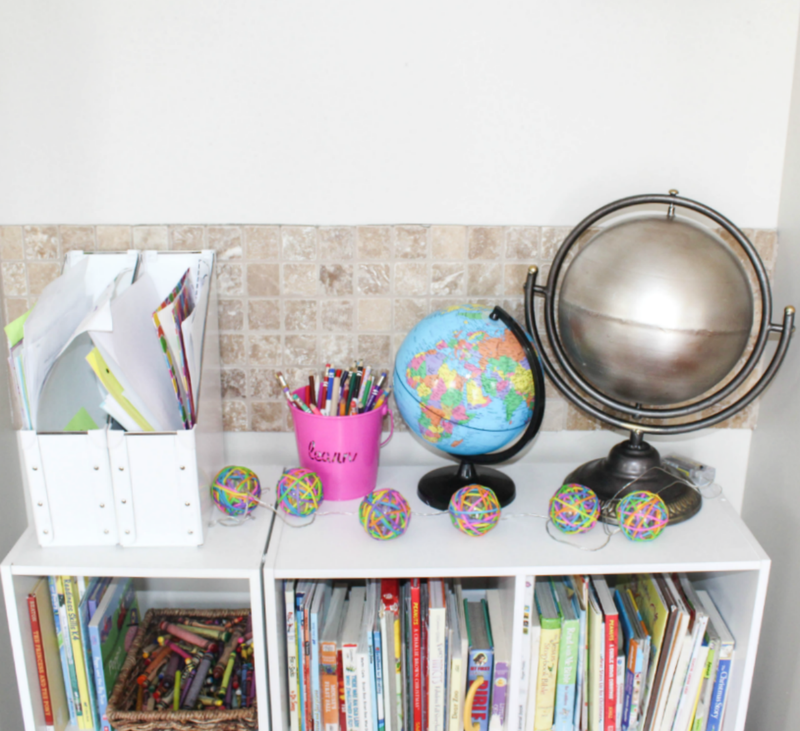 Once we were not going to homeschool, I really wanted a kids command center and figured this spot would work best for it. In our previous home, I’ve always wanted a place to hang their art without hiding them. Because it was such an opened space, we didn’t have much walls out in the open to hang them. 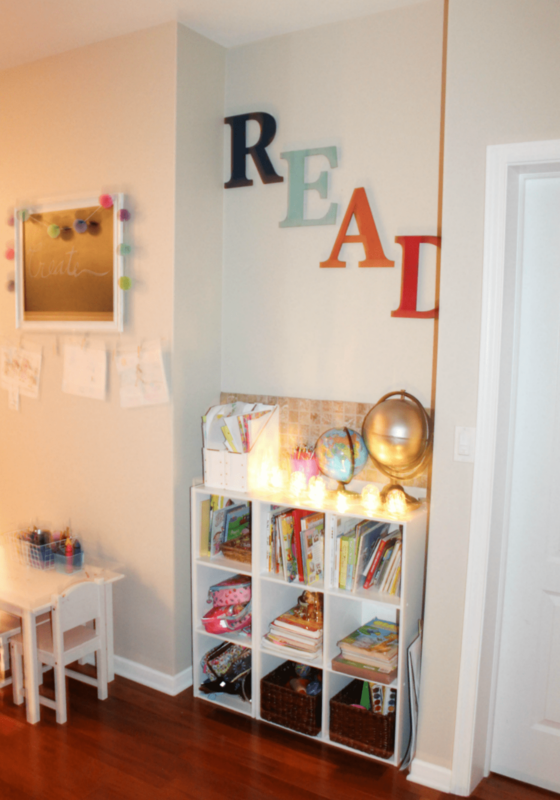 Our one tiny extra wall that was not the mantle or TV center was used to hang that read sign along with some other kids wall hangings. I’m really pleased to have this wall to hang some of their art work. What do you think of the R.E.A.D letters? I bought them from At Home stores a while ago and seriously love them. 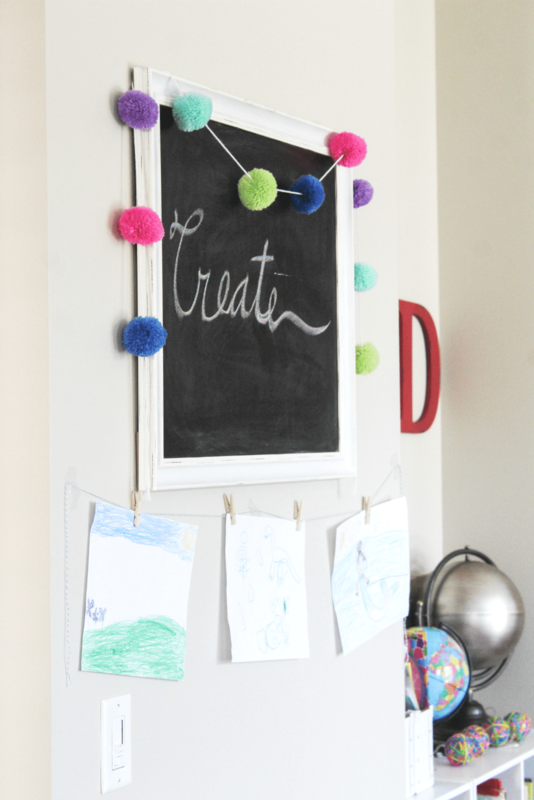 They are big, bold, colorful and kid-friendly and really add a statement to the wall. I wondered if I should have put them and the cubical organizer on the left and the art and table on the right. But then I thought the cube organizer seemed to work best in the spot it is in now. I was anxious to hang up some art the kids did that very week I was creating the center. There might be a big gap between the chalkboard sign, art and table set below but I didn’t want to add too much to make it cluttered. Plus, we sometimes paint on canvas so they can have the extra spot below to put them on the wall if they wanted to. When the kids come from school, they bring their backpacks and unload them here. The school papers get taken off from their folders and put on the nearby breakfast table. They are always eager to show me those papers. Sometimes I look at them while they are showing me (before they put away their backpacks). And other times, if I stand or sit in the front entry way while they take off their shoes and sweaters if it is cool, they’ll start to get their papers out and start showing me them. They are just that eager. But we are working on unloading backpacks in this designated corner, papers on the breakfast table, lunch boxes unloaded and containers and cups in or by the kitchen sink and everything else put away in their spot before sitting down to look at the papers. That way, the area looks a bit less chaotic with stuff all over the floor and they can be can enough for us to look at the papers together. We do this at the breakfast table and they will have their snack while we go through the papers from their “take home” folders. If there is homework to be done by our 2nd grader, we’ll do it after her snack. That way, we are not scrambling later in the evening while trying to get everyone to bed at a reasonable time. During this time, sometimes our Kindergartner will finish a project (coloring or so) that she didn’t finish in class. She doesn’t have to return them but she just likes to finish them. Note: Since I usually help them with what they need, that little table would be too small for me to sit at so the breakfast table is the better option for me. 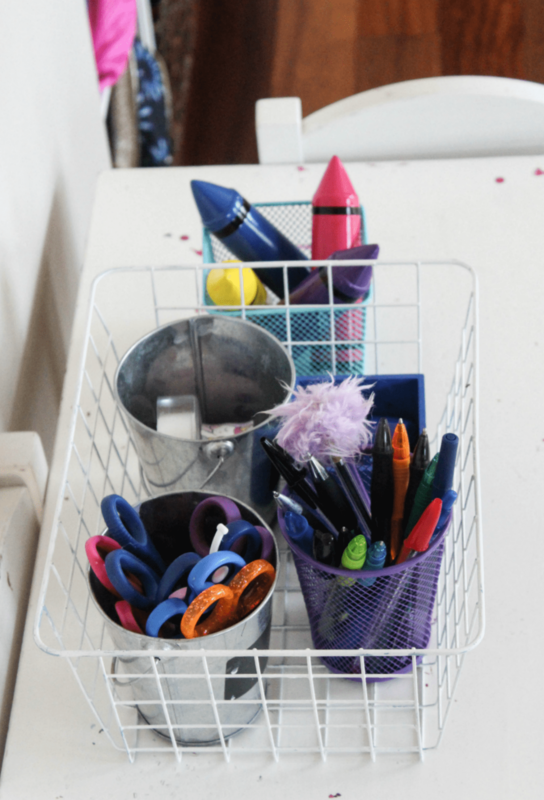 Both girls have a filing bin that they put their papers in – the ones we don’t have to return to school (if it’s not homework or something the parents have to sign or fill-in). I was planning on doing just a homework station here. However, while figuring out where to put stuff during our move, I temporarily set the little table here until I figured out where to put it. The breakfast table is not too far from it and I thought it would just be too many table and chairs close to each other. But the kids seemed to love to do their play-doh and art activities on it rather than on the breakfast table. 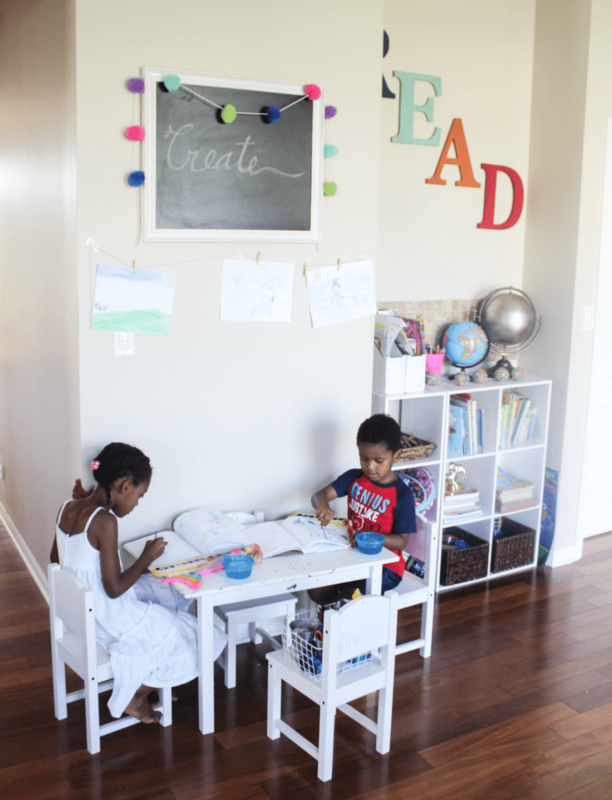 Seeing how much they love the table here, I figured I would make this corner sort of an all in one kids corner for school stuff, art stuff, play-doh and other craft stuff. Don’t mind the paint spots and crayon marks on the table. It’s a sign of use and I sure love it. I started to clean off some with rubbing alcohol (it removes it) but then decided to leave some paint to show how much they love using it. I took the photos on the weekend when they were home so their backpacks and lunchboxes would be here for them too. But was happy to snap a few photos of the kids while they used the “center”. These images with the kids in them were not staged. Like this one – I turned around and there those two were water painting while the other child was playing or doing something else. I told you they love using this table as their activity table. Sometimes they even bring their snacks there. Or an occasional weekend lunch. Notice the lights? I bought them at Target for $3. They are battery operated and the kids love having them on at nights to look at the cozy glow. And here is a full shot look at the space from this angle. I really love this space. It’s kind of off the kitchen and adjacent to the breakfast nook. You can even see a couple breakfast chairs here in this photo. 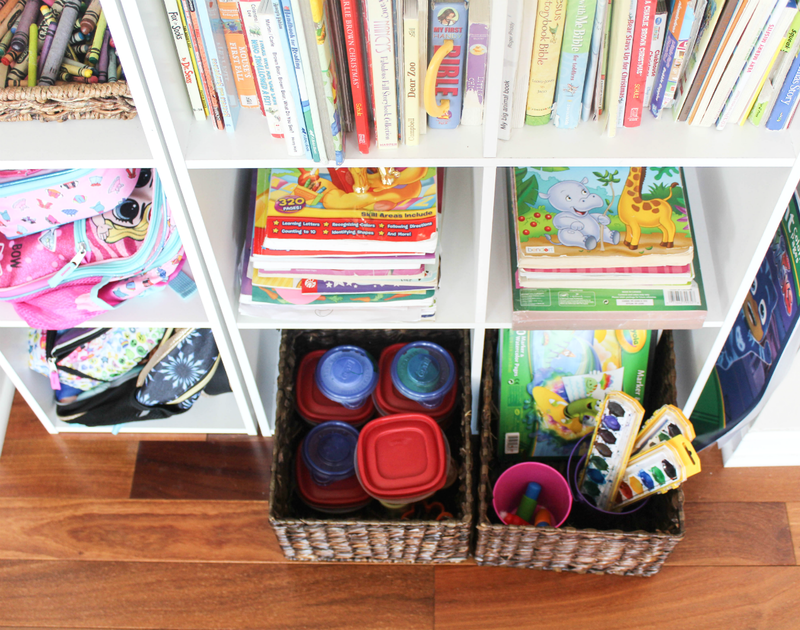 The kids are loving it and it has made organizing their school stuff, books, art and craft so much easier. Do you have kids in school? 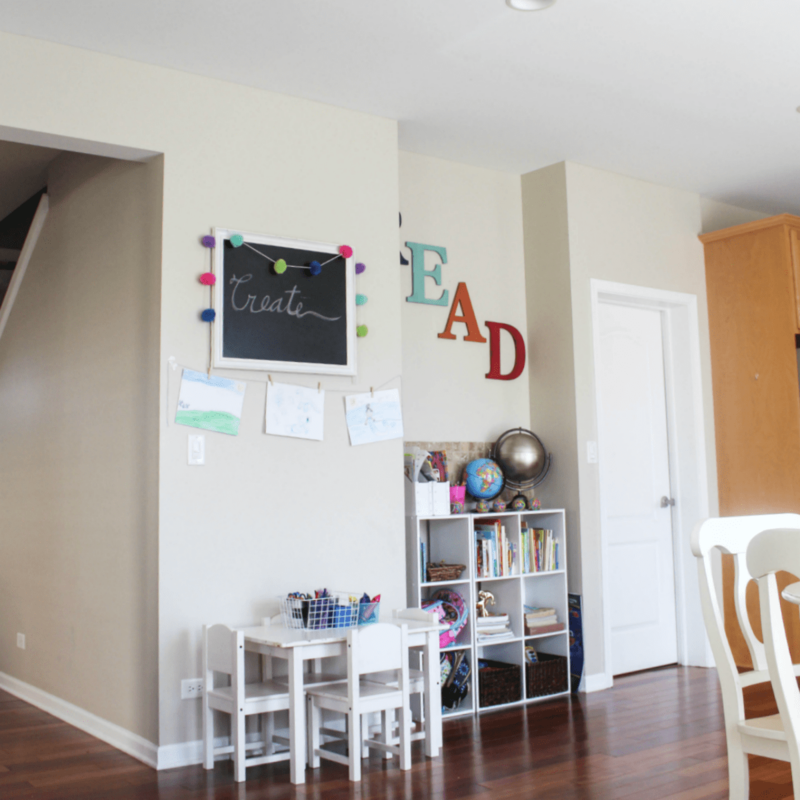 Do their stuff end up all over the house after school or did you create a little center for them?